Installing the best panic or emergency alert system for your office will give you peace of mind knowing that any emergency in the office will be responded to as fast as possible, and that you are doing your best to keep your employees safe. There are a range of these type of alert systems available, but most operate by the same basic principle. 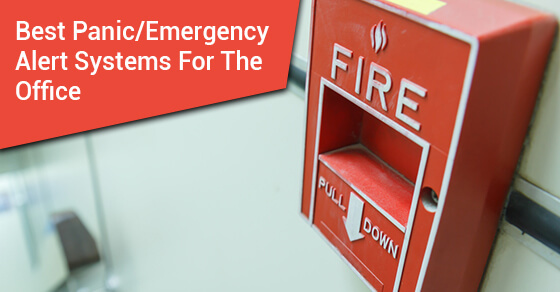 In the case of an emergency, whether it is medical, a physical threat or something else, a button is pressed, triggering the alarm which then notifies others in the building, as well as alerting the monitoring company so that emergency services can be dispatched. These panic alert systems can also be helpful in medical emergencies for employees who have known conditions, such as seizures, falls, allergic reactions, etc. It’s important that each employee provides their medical information upon hiring, so the office manager can be made aware of possible medical emergencies, and take preventative measures, or choose a system to best address these emergencies should they arise. Most panic or emergency alert systems come as a bracelet or pendant with a button that can be pressed to dispatch emergency services through their ULC monitoring company. These are more often thought of as being used by seniors or those with health conditions. In an office setting, there are more applications and you can leverage your office’s existing security system in order to provide this service to your employees. If you don’t have a security system in your office, or do not require one, you can still use a system such as this. A basic system can be installed which works wirelessly and transmits alarms to a monitoring company. These kind of alert systems are great for the office as they can be bundled with other monitoring systems, such as carbon dioxide detection or fire alarm monitoring. If there is an individual in the office with a health condition that can lead to frequent medical emergencies, you should encourage them to use a wearable medical alert bracelet, or other system. Chances are, they already have a system in place, but as the office manager it’s important to be aware of each employee’s health, and make sure every precaution is being taken. By installing an alert system in your office, you show that you have the health of your employees in mind and that workplace safety is important to your company. To learn more about your medical alert system options, call us today at 888-789-FIRE or request a quote here.